Kai Masters is in his test room developing a new battle weapon which fires balls of ice as well as wind when a new alert warns him of trouble in wind land. With his dogbot BC, he takes the bullet train back to base to prepare for battle with another mutant beast. This battle may be harder than the last one. 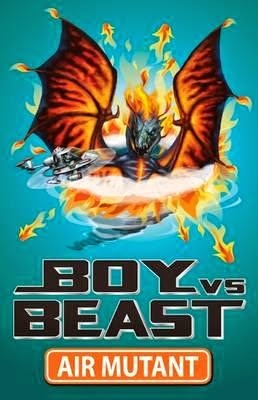 Boy vs Beast is popular among young boys. With all the gadgets and futuristic transportation, pictures to illustrate the choices Kai makes when choosing battle gear and the entertaining pests (like the flying jellyfish which hurl toxic balls), it's no wonder young boys love this series. It feels Ike an action cartoon series with the levels, land layout, weapons and fighting strategies of a computer game. In Air Mutant, Kai and BC battle new beast Flamatoraq. If the beast wins, it gains more powers, gets bigger and stronger. If Kai wins, new rooms at base may be unlocked, his battle gear upgraded and with the beast safely transported to the Outlands, Earth will be safe once more. Short chapters, large clear writing, lots of pictures and many more titles makes this series great for young boys and beginner readers, six years and older.